Oh my! Where do I even begin? I have no words to describe how weirdly wonderful this book was! 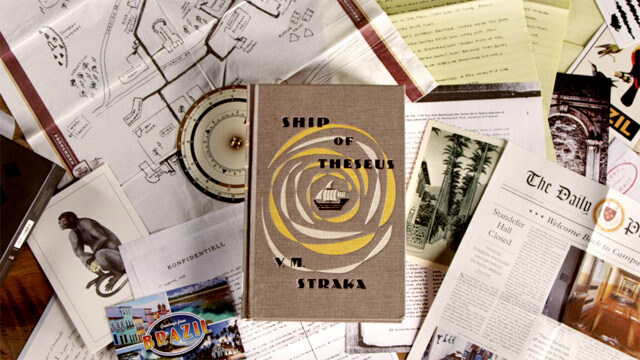 I’ve been meaning to write a book review about Ship of Theseus by JJ Abrams & Doug Dorst for ages, but I couldn’t find the words… I didn’t know how to show you the amazingness that is this book! Do you see all these things in the background of the photo above? Yeah, they’re not just background. They’re all actually part of the book! All of those newspaper clippings, old documents, letters, everything comes folded in between the pages of the book, and as you read the story these “clues” will help you (and the two college students who keep leaving notes to each other on the sides of the pages) figure out who the author of the book really is. My favourite part was the side story of the two college students throughout the book. I mean, the main story is brilliant but it took me a while to get into it because I was so interested in getting to know the two students and in how they slowly get to know and trust each other. I recommend reading one chapter at a time, first you read the main story then read the side notes and clues, then (and only then) you should go on to the next chapter. Still not convinced if you should read this book? Even Will Wheaton gave the Ship of Theseus 5 stars on Goodreads 😀 I’m having a bit of a Sheldon Cooper moment here (I’m so addicted to The Big Bang Theory! Why did they put that on Netflix? Now I’ll never be productive again!). Sure, not everyone will enjoy it (Some people don’t even like chocolate! What’s up with that?! ), but it’s worth giving it a go. This may be your new favourite book! 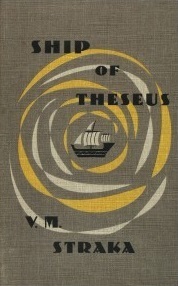 Find Ship of Theseus by JJ Abrams & Doug Dorst on Amazon and Goodreads. I just saw this review… I DNF Ship of Thesus about a month ago, not because it was bad- it was amazing- but because it was so intimidating. i guess I should try again, based on how much you and other bloggers loved the book. Oh you should definitely try it again! It took me a while to get into it, but by the second half of the book I was hooked! 😀 It’s a brilliant book!